2 Psychodrama workshops were conducted at BRAC JPGSPH by Sue Daniel, Trainer, Educator, and Practitioner of Psychodrama. Sue is also the Director of Psychodrama Institute of Melbourne. The workshops titled, “Today’s Leaders: Workshop in Sociometry and Role Training” and “Psychodramatic Action Methods in Public Health: Experiential Workshop in Sociometry and Psychodrama” were respectively held on 22 and 23 April 2018 at BRAC JPGSPH. The first workshop titled, “Today’s Leaders: Workshop in Sociometry and Role Training” was held on April 22. The participants were young men from local slums, who received experiential training on sociometry. 3 Groups were also formed during the workshop to establish local clubs for performing Psychodrama in their community. 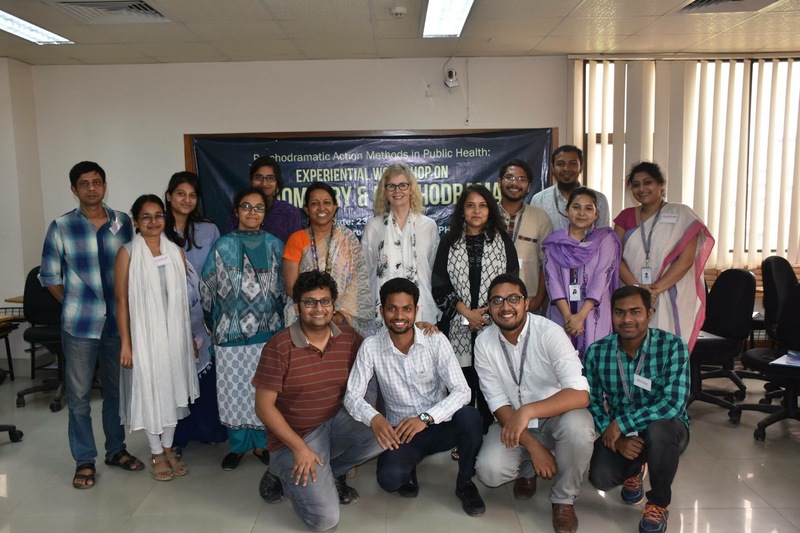 The second workshop on April 23 was titled, “Psychodramatic Action Methods in Public Health: Experiential Workshop in Sociometry and Psychodrama”. It was an internal workshop with participants from BRAC JPGSPH. Participants learned about different methods of psychodrama such as Social and Cultural Atom, Role Chart and Role Reversal, in the workshop.